French opera was big business in the first half of the 20th Century, popularized in no small part by such great singers as Lily Pons, Mary Garden and Ninon Vallin who excelled as Lakme, Delilah, Mélisande, and Marguerite (“Faust”), in operas that have all but disappeared from today’s standard repertoire. So when the Los Angeles Opera announced its ‘dream cast’ of Les Contes d’Hoffmann / Tales of Hoffmann in February, excitements ran high at the prospect of seeing the reigning Italian hot throb Vittorio Grigolo as poet E.T.A. Hoffmann, opposite German superstar soprano Diana Damrau as the four heroines of his ill-fated romances. Alas, the dream was short but sweet. A week following the cast announcement, Ms. Damrau came down with bronchitis and had to settle for only two of the heroines (Antonia and Stella); while her husband bass-baritone Nicolas Testé also fell ill before the opening night but lip-synched through his four villain roles with a cover singing from the pit in his behalf. A fantastical plot just got more fantastical. Fortunately, by the time of the second performance that I saw on Friday, April 30, the off-stage drama had been resolved to general satisfaction. Bass-baritone Christian Van Horn was flown in from Dallas to tackle the four villans and he succeeded brilliantly, singing with satisfyingly firm, dark tone and acting with the versatility and sinister bravado (as the punk-rock Coppelius) of a Lon Chaney in “The Man of a Thousand Faces”. One wishes for Mr. Testé’s speedy recovery, but would be happy to see Mr. Van Horn in all the performances. Covering the four women of Hoffmann were, by order of their appearances, So Young Park’s bright and clear-as-bell Olympia, mezzo-soprano Kate Aldrich’s sensuous seductress Giulietta and Diana Damrau’s passionate, vocally splendid singing as Antonia and actress Stella – with nary a sign of her bronchial afflictions. As expected, Italian tenor Vittorio Grigolo sang with a seemingly inexhaustible supply of power and slancio as the eponymous hero. His ‘Kleinsack’ number in the Prologue can best be characterized as an ideal vocal dramatization of a mad poet and a drunkard. As the evening progressed, one noticed Mr. Grigolo’s tendency to squeeze his pianissimo high notes to the point of inaudibility, a novel effect that got tiresome after more than a couple of times. Mr. Grigolo is too good a singer to be resorting to such cheap histrionics. As Hoffmann’s loyal companion Nicklausse and the Muse of Poetry, mezzo-soprano Kate Lindsey practically owned these parts and made the most of the extra music and dialogues given to her characters in this Michael Kaye version of the opera (one new aria each in the Prologue, Olympic Act and the Epilogue). French tenor Christopher Mortagne served up comic relief as the four servants, with Frantz being the most memorable for his newspaper magic trick, and Rodel Rosell was a very funny inventor Spalanzani. Rounding out this large cast were talented members of LA Opera's Domingo-Colburn-Stein Young Artist Program: tenor Brian Michael Moore as Nathanaël, baritone Theo Hoffman as Hermann, baritone Kihun Yoon as Luther, bass-baritone Nicholas Brownlee as Crespel, and baritone Daniel Armstrong (alumnas) as Schlémil. With superstar tenor and conductor par-excellence Plácido Domingo leading a fine ensemble in the pit, what is there not to like? Not so much, except maybe the faster-than-usual Barcarolle that opened the Giulietta/Venetian Act, turning the gently-undulating gondola into a speedboat. The rest of the opera was smooth sailing with exceptionally vivid playing from the L.A. Opera Orchestra. 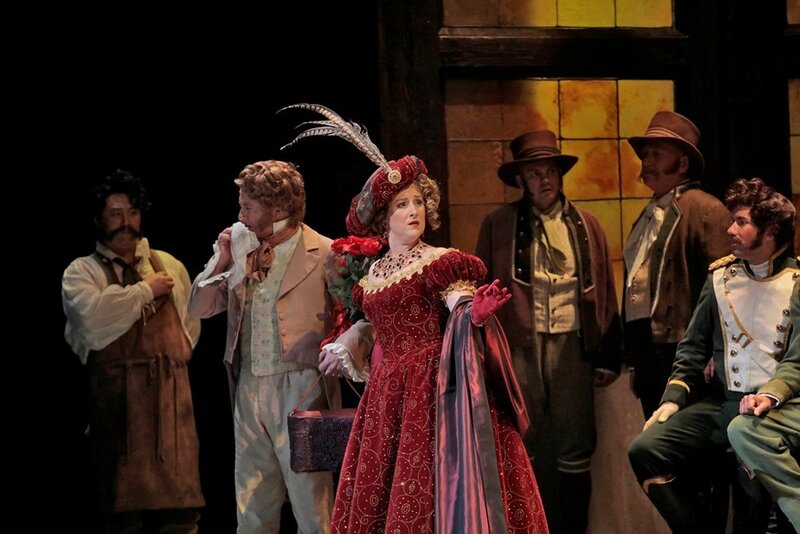 The L.A. Opera Chorus was topnotch in their acting and singing filled with tremendous joie de vivre. 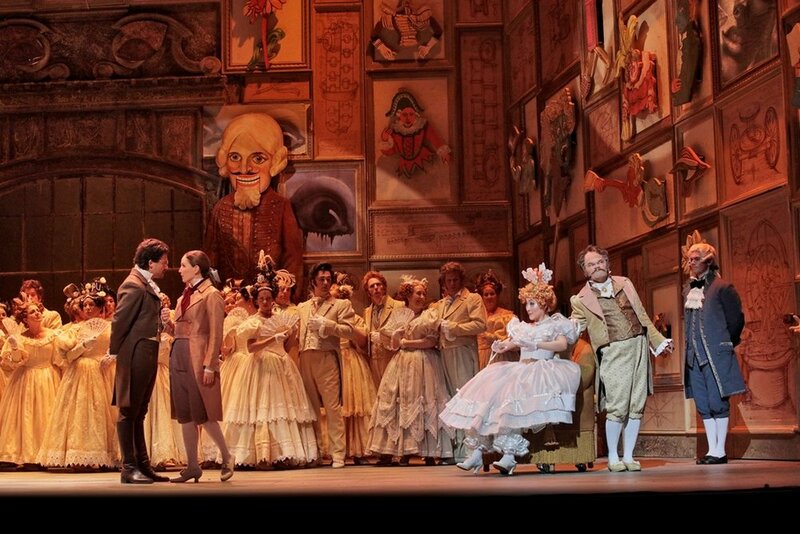 Three more performances of “Hoffmann” remain on April 6, 9 and 15.